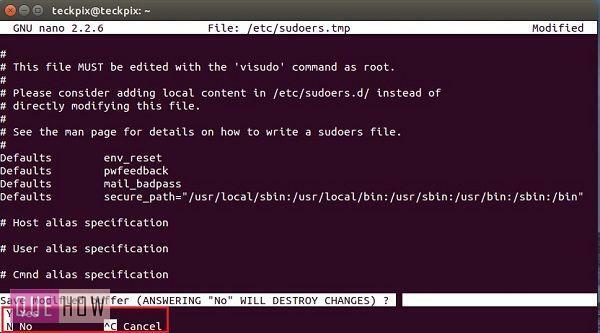 When you use the sudo command while working on Ubuntu terminal then, you’ll be prompted to provide your Ubuntu password. However, after typing your password, you’ll not be able to see it. Sometimes it’s quite confusing and irritating as you have to provide your password for more than one time. 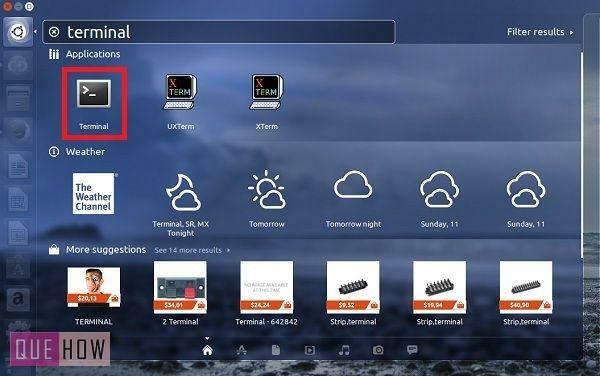 So, just by having a glance at this article, you’ll be able to know how to display your password while using terminal in Ubuntu 14.04. Step 1: First go to the Unity dash and type “terminal”. You’ll see a terminal icon just click on it to open. You can also use “Ctrl + Alt + T” to directly open your terminal. 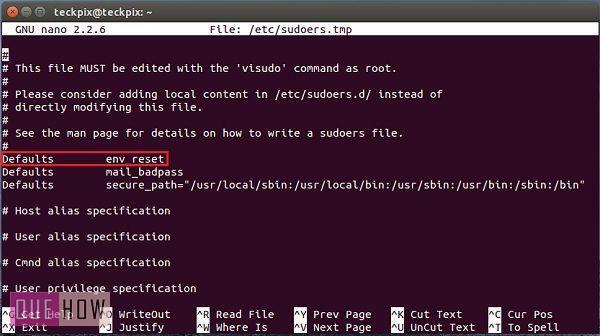 Step 2: Under ‘terminal’ type: “sudo visudo” and press enter. Step 3: Now, provide your Ubuntu password for authentication. 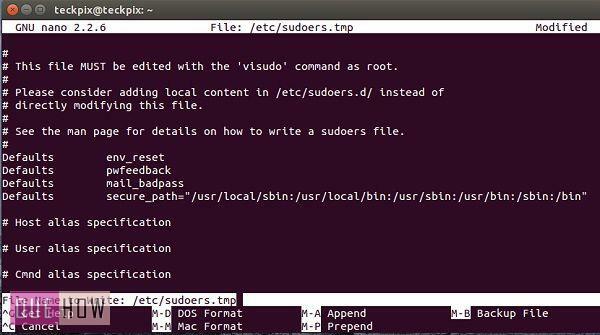 Step 4: You’ll see “/etc/subdoers.tmp” file gets open up in the terminal. Under that file, you may see “Defaults env_reset” as marked in the image below. Just hover your cursor at the end of that line. Step 6: You can also press enter after “env_reset” and create a new line as “Defaults (press tab) pwfeedback”. Once you have made the changes, then press “Ctrl + X” to exit the file. Step 7: Now press “Y” (yes) to modify your changes. Step 8: You’ll be asked to change the file name. It is recommended to directly press enter. 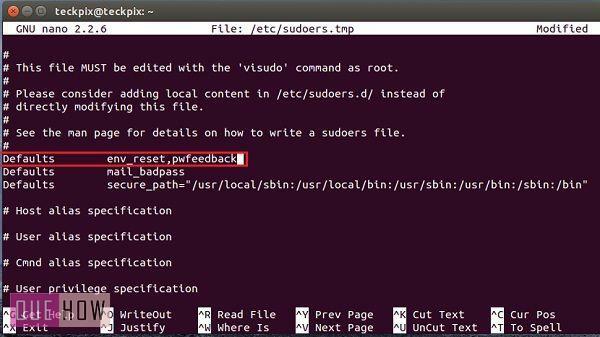 Step 9: Finally, close your terminal by using “exit” command. Step 10: Now, again press “Ctrl + Alt + T” to open your new terminal. 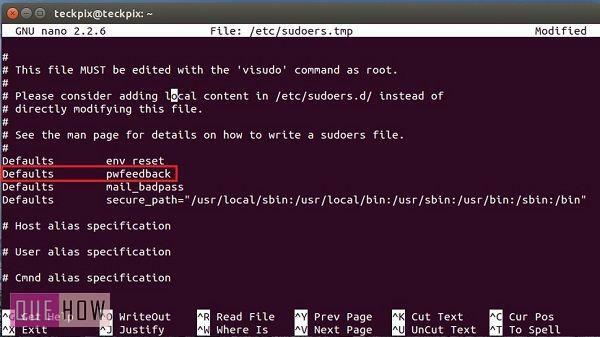 Here, type “sudo visudo”, you will be asked to provide your password. While typing, you may see (*) sign. Hence, your password is now visible.